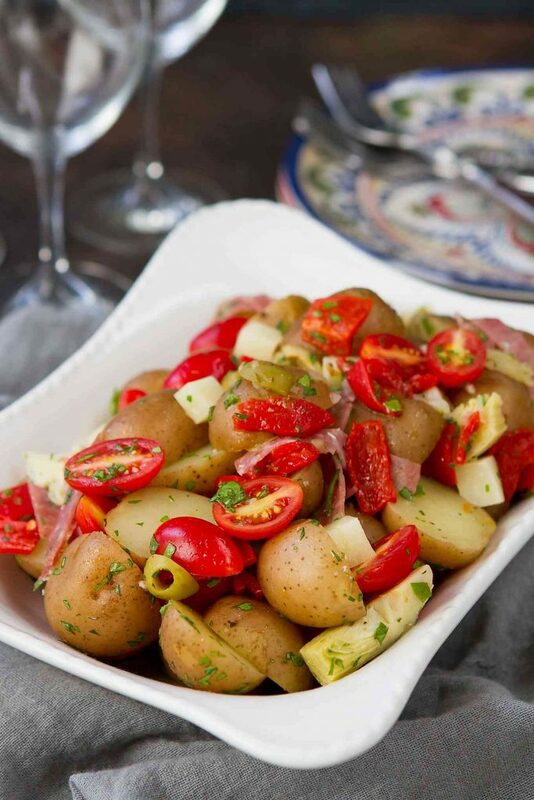 Serve up this Warm Antipasto Potato Salad recipe at your next barbecue or alongside a roast chicken for Sunday dinner. Thank you to The Little Potato Company for helping me share this recipe with you. Luckily, my family is willing to play along with the charcuterie board idea on occasion. But when guests are coming over for dinner, I’ve accepted the fact that I might need to play hostess rather than college-kid-pulling-random-stuff-out-of-the-fridge. That being said, there is no rule that says I can’t incorporate all of my favorite charcuterie board ingredients into a fantastic antipasto potato salad. Tomatoes, thinly sliced salami, diced provolone cheese, artichoke hearts, roasted red peppers and olives…yep, I went to town! Change up the meat (or leave it out altogether for a vegetarian version), add a variety of pickled vegetables or swap in your favorite cheese. The beauty of charcuterie boards is that they can be customized any way you desire. 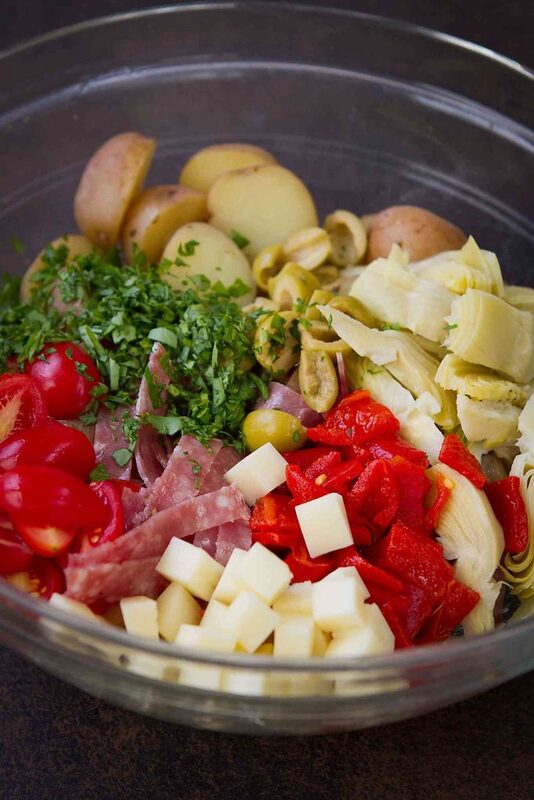 That being said, there’s one thing you can’t change up or sacrifice in this antipasto potato salad. You guessed it…the potatoes. By now, you guys have probably picked up that I’m a diehard fan of the Creamer potatoes from The Little Potato Company. Naturally sweet, packed with nutrients and the perfect size for popping in your mouth or cutting in half for bite-sized potato salad forkfuls. With all of the flavors from the antipasto mix-ins, I opted for a very simple vinaigrette. Good extra virgin olive oil (don’t skimp when it’s in a dressing! ), white wine vinegar, and a pinch of dried oregano and salt. If drizzled in when the potatoes are warm, the vinaigrette will soak into the potatoes, rather than just coating the exterior. 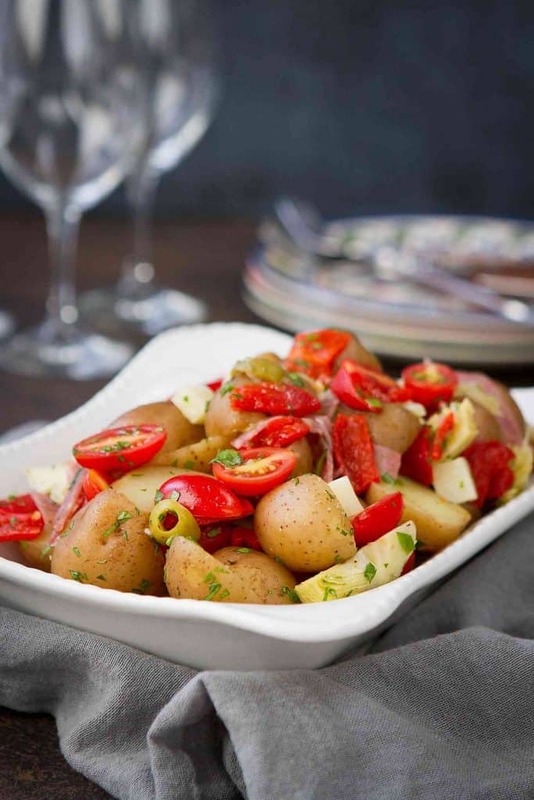 While fantastic served up at room temperature as a barbecue side dish, this antipasto potato salad is best served warm, which makes it a contender for Sunday dinner. Perfect alongside a roast chicken or roast beef! Cut the Creamer potatoes in half and place in a large saucepan. Cover with cold water by an inch. Bring to a boil. Cook until the potatoes are tender, but not falling apart, about 20 minutes. Drain. Transfer the potatoes to a large bowl and toss with the dressing. Add the tomatoes, artichoke hearts, cheese, salami, roasted red pepper, olives and parsley. Stir to combine. Serve warm or at room temperature. In a small bowl, whisk together the olive oil, vinegar, salt and oregano. Looks so good, and no mayo…yeah!!! 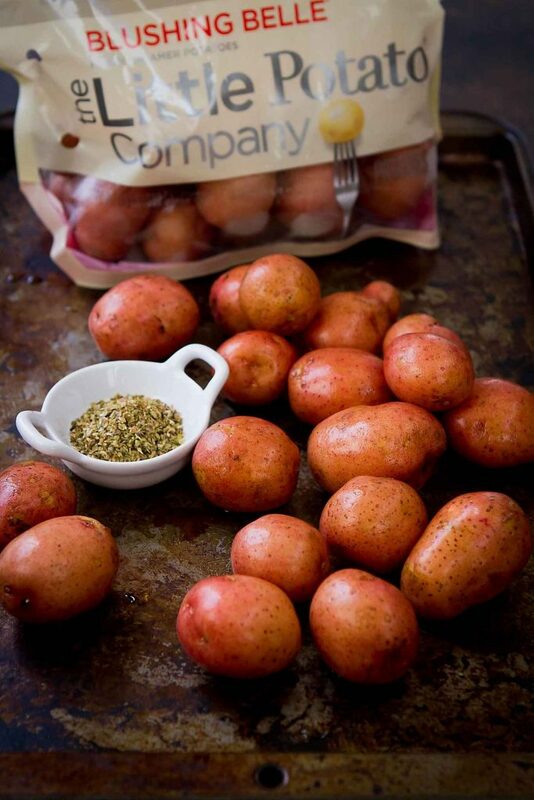 WE already have new red potatoes from the garden so will make this soon! How have I never had a warm potato salad? I love this idea and even more love that it doesn’t have mayo! I love salami in just about anything – and those are my favorite potatoes! This looks so yummy! I love the idea of an antipasto potato salad. Genius! I love their potatoes. I’m allergic to mayo so I dig this recipe. I only eat warm potato salad for some reason. This is sheer perfection. I’m a snack girl so I fully support your love of Charcuterie boards. This is calling me name! Looks delicious!! I for sure want this!! Tomatoes in the pic, but not in the recipe??? Sorry about that, Marian! The edit has been made. I hope you enjoy the salad.